When you and baby are hitting the road for a stroller walk, a trip to the mall or a visit to Grandma, do yourself a favour and stash a few nibbles in your diaper bag. The right snacks can tide you both over between mealtimes and keep the crankies at bay. At this age your little one probably has a few teeth and enough dexterity to pick up little nibbles and feed himself. Your best snack choices will be easily carried in a small plastic container, and you’ll probably want to choose foods that won’t leave crumbs and smears everywhere. Softer items like cut up bananas are great for the high chair at home, but can leave a mess on little fingers (and your sweater). 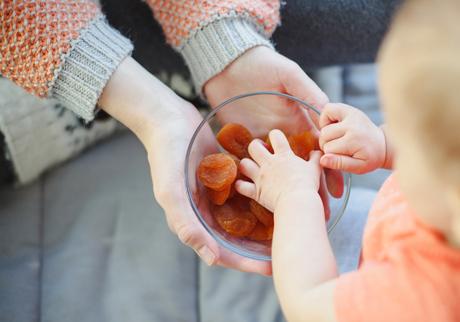 You’ll get to know your baby’s favourite snacks, but here are some ideas to get you started. Dry cereal: Perennial favourite Cheerios are great for little teethers. Experiment with other low-sugar choices to find your child’s favourite. Biscuits: Some babies love to gnaw on teething biscuits like Baby Mum-Mum. Whole grain, salt-free or low-sodium crackers might appeal to your baby too. She could even share your biscotti; watch carefully in case she breaks off a chunk though, and be sure to select a brand with a low sugar content. Others: If your baby has tried dairy products, tiny cubes of cheese are an option. A container of mini yogurt or fresh cheese is another choice if you can keep it cool and take a break to spoon-feed your baby. Mini muffins are easy for tiny hands to hold. Don’t forget to carry a few treats of your own: granola bars or a zip-lock bag of cheese and crackers or mini carrots are easy grab-and-go options.